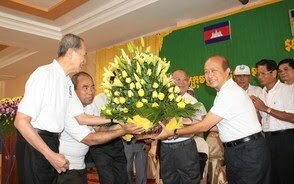 Prince Ranariddh (R) receiving flowers from party officials after his re-election as the party president. after more two years of absence. contribute to resolving the real national issues”, he said. Mr. Son Chhay, a senior MP from the major opposition Sam Rainsy Party, said he welcomes Prince Ranariddh’s re-entry to politics, saying that politicians cannot stay away from the national issues and their people. Mr. Keo Put Rasmy, president of the royalist Funcinpect Party, also welcomes Prince Ranariddh’s return to politics and is waiting to negotiate with the prince to create a new party called Funcinpec Party 81, adding the birth year of the creation of Funcinpec Party in 1981 to the party name. to form an alliance as well”, he said. disappointed with his leadership so many times.